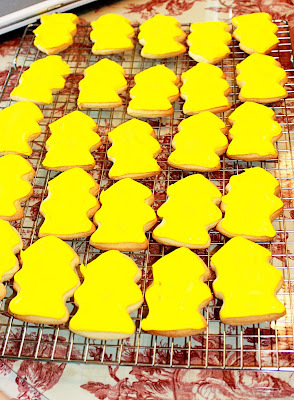 I love making my signature sugar cookies as favors to guests for the baby shower. Also, I wanted to join Jen and share these recipes with everyone. Given the Fire Engine theme of the baby shower, I decided to make fire hydrants and dalmatians. So I baked the cookies and then time for the fun. First decorated the fire hydrants yellow. Then add a little outline to them. 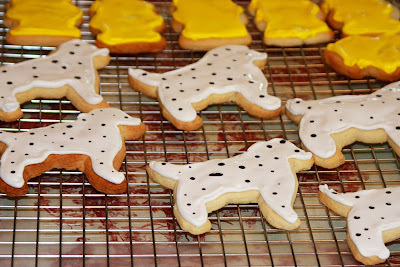 Next, decorated the dalmatians white. Then very carefully, dropped black royal flooding icing onto the white royal flooding icing to create the dalmatian spots. 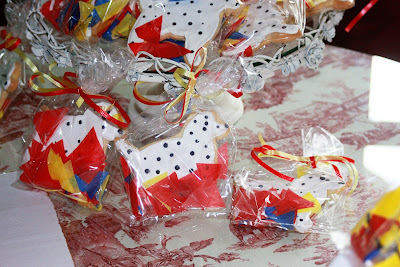 After drying for several hours, I carefully placed the cookies in the decorative bags and used the leftover tissue paper as decorative accents to the cookie bags. I tied the bags with coordinating ribbon. 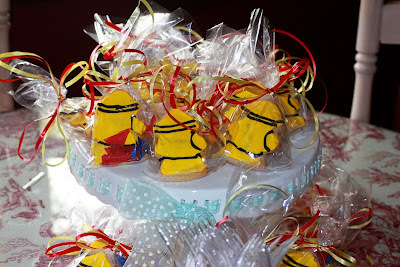 I even used the cookies on the cake table as centerpieces. 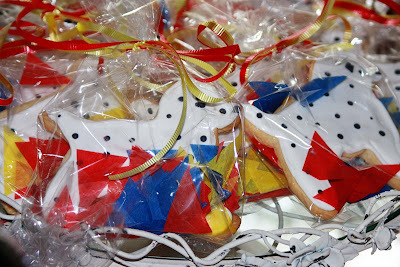 The cookies are an easy and inexpensive way to make the party special. They add a festive touch and the recipient always feels special. I hope you try these cookies. 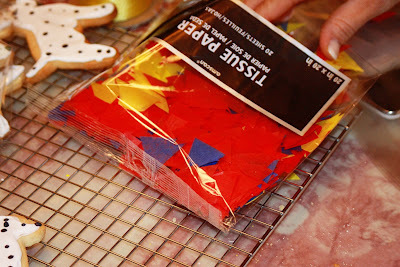 This icing is used to outline the cookies and decorate the cookies after they have been flooded. Beat the ingredients until icing forms peaks about 7 to 10 minutes in a heavy duty mixer or 10 to 12 minutes at a hand-held mixer. Girl you just amaze me! Those are adorable and I know everyone was absolutely thrilled to receive them. Oh how cute. 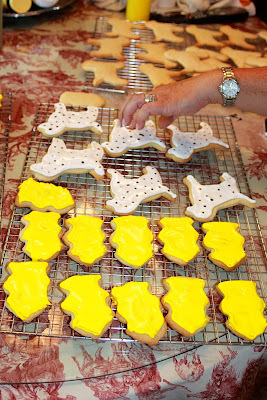 I have lots of cookie cutters and love to give special ones as gifts. The dalmations are so cute and I love the way you packaged them. I'm going to keep your recipe as it's not as easy as some may think to have a good taste and hold the shape of the cookie. These are gorgeous, Cynthia. I think I need to get to a store to look for meringue powder :) Thanks for stopping by my blog. Yours is awesome! OMG, those are sooo cute! I love sugar cookies. These cookies are so beautiful! You are just amazing and talented. I've tried doing "perfect" cookies and mine just taste good but look messy! Perfect for the baby shower! Yum. My favorite kind of cookie! You are such a wonderful friend -- what a generous heart you have! And Patrick just said sitting over my shoulder "yum, those look guuu-uuud! 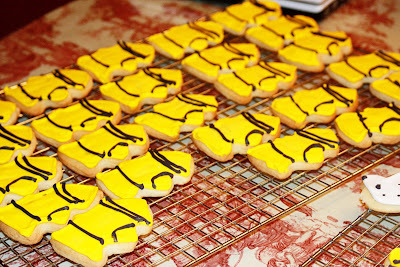 Makes me want some cookies...."
wow cynthia - these are fabulous! you are so talented! Hi, first time droppin by your blog. 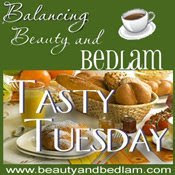 Came over from Tasty tuesday's recipe blog hop. I am going to try these cookies. I've always wanted to be able to make these type of special decorated cookies. Thanks for sharing. i saw you were from knox when i looked at life in grace's site. i'm from straw plains. about 15 minutes from downtown knox! I love sugar cookies! This is a really great idea!